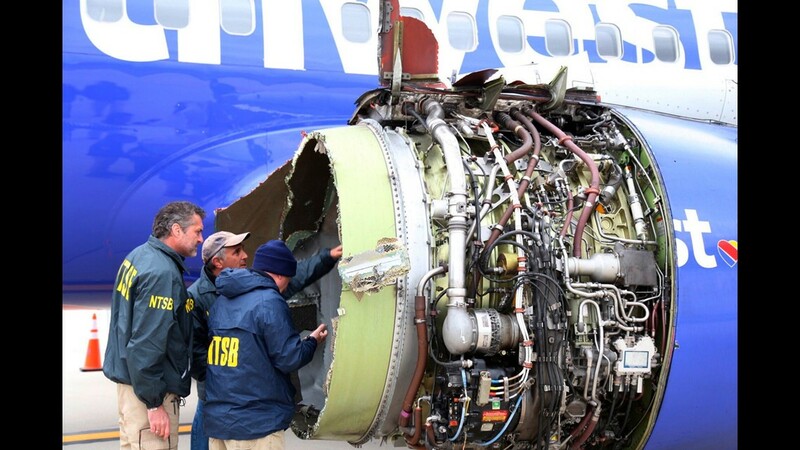 A handout photo made available by Instagram user ABOURMAN showds the damaged engine of Southwest Airlines flight 1380 which was en route from LaGuardia Airport in New York City to Love Field in Dallas, Texas when it exploded in flight sending shrapnel into the fuselage, April, 17, 2018. 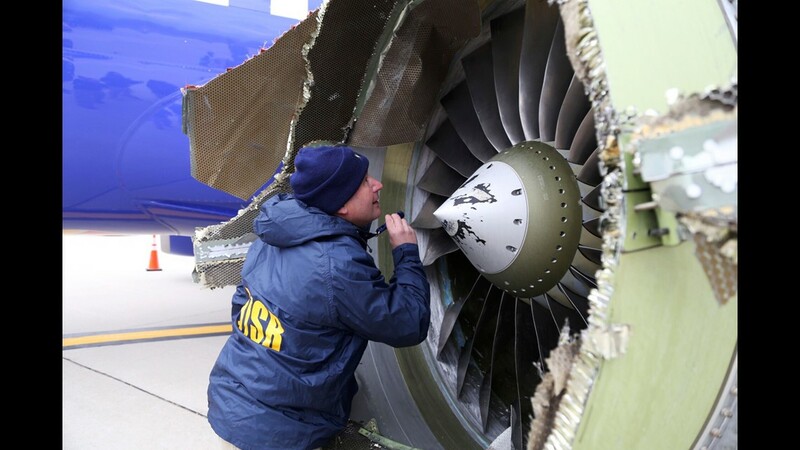 President Trump paid homage Tuesday to the Southwest Airlines crew and three passengers hailed as heroes after an engine blowout damaged their plane's fuselage and killed a passenger who was partially sucked out a window. Tammie Joe Shults, captain of Flight 1380, First Officer Darren Ellisor and the three flight attendants were Trump's guests at the Oval Office, where he lauded their "bravery and compassion." "They said you were calm and strong and cool" during the harrowing flight, Trump said. "So thank you very much." 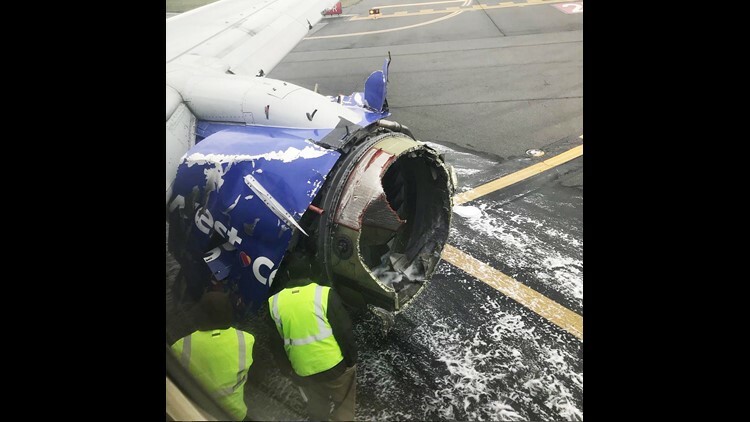 The Dallas-bound flight left New York's LaGuardia Airport on the morning of April 17 with 144 passengers aboard. 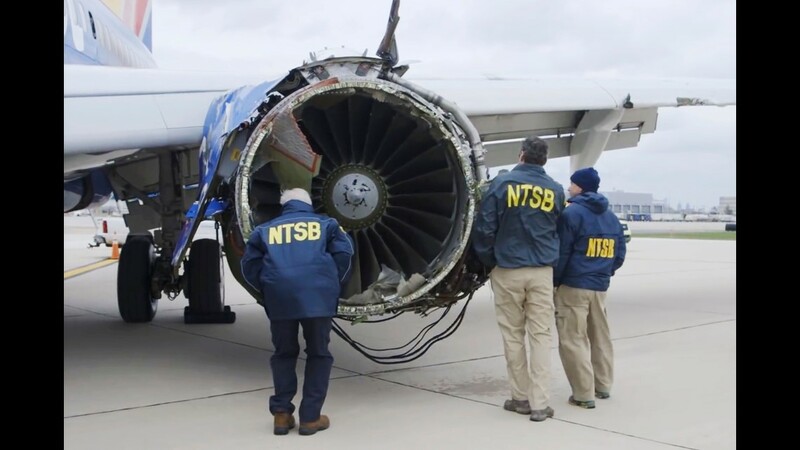 About 20 minutes into the flight — at 30,000 feet — passengers heard a bang and felt a bump as a fan blade broke off in the engine, causing it to explode. Shrapnel spewed across the fuselage and broke a window. Jennifer Riordan of Albuquerque was sucked halfway out of the plane, requiring two passengers to pull her back on board. She was the first passenger death on a U.S. airline since 2009 — and the first in Southwest Airlines' history. Three passengers who tried in vain to save Riordan's life also attended the brief meeting. Trump described how firefighter Andrew Needum and fellow Texan Tim McGinty, a real estate agent, pulled Riordan back into the plane. Retired nurse Peggy Phillips then helped administer CPR until the plane's emergency landing in Philadelphia. "While there was nothing else they could do, these Americans responded with tremendous bravery," Trump said. Several other passengers suffered injuries described by authorities as minor. Many passengers lauded the efforts of the crew in the days following the incident. They were "brave, composed and helpful" throughout the ordeal, William Madison, 56, told USA TODAY days after the flight. While the passengers waited for buses back to the terminal, Shults explained what happened. She waved off accolades, saying it sometimes was easier to be the pilot than a passenger. "She was calm and she was collected," Madison said. "I thought, hot damn, that might be the coolest woman I have ever seen." That said, the litigation has begun. Lilia Chavez, a passenger from California, was seated three rows behind Riordan and claims she suffered physical injuries as well as "post-traumatic stress disorder, anxiety, emotional distress, depression." 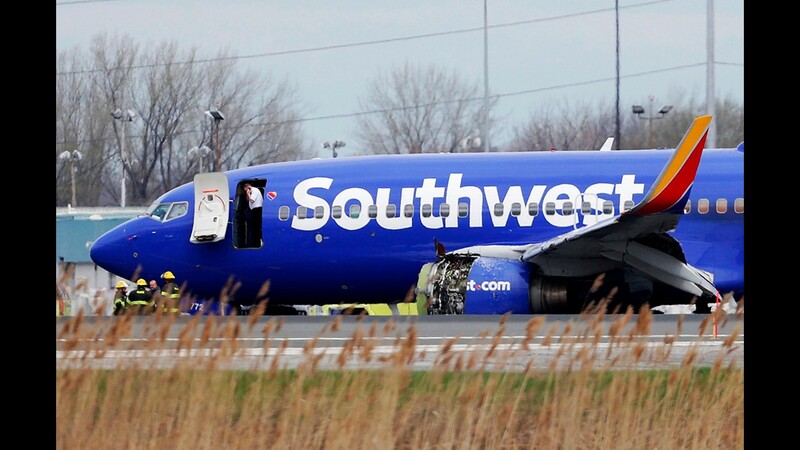 Southwest has declined to discuss pending litigation. 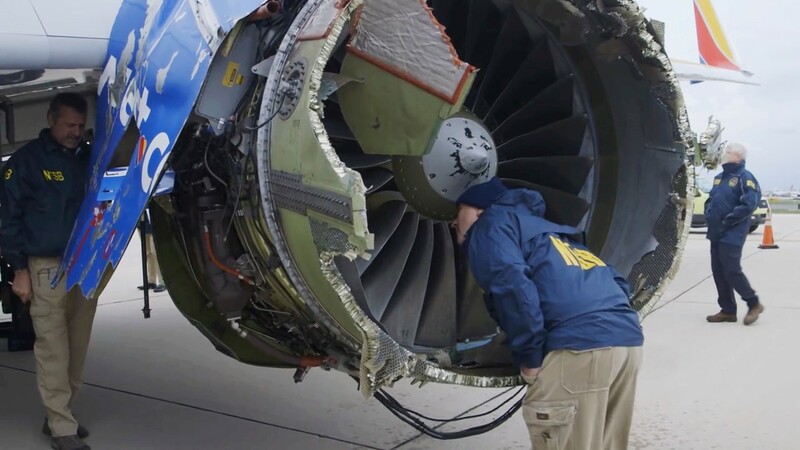 A National Transportation Safety Board investigator examines damage to the engine of Southwest Airlines Flight 1380 that made an emergency landing at Philadelphia International Airport in Philadelphia. 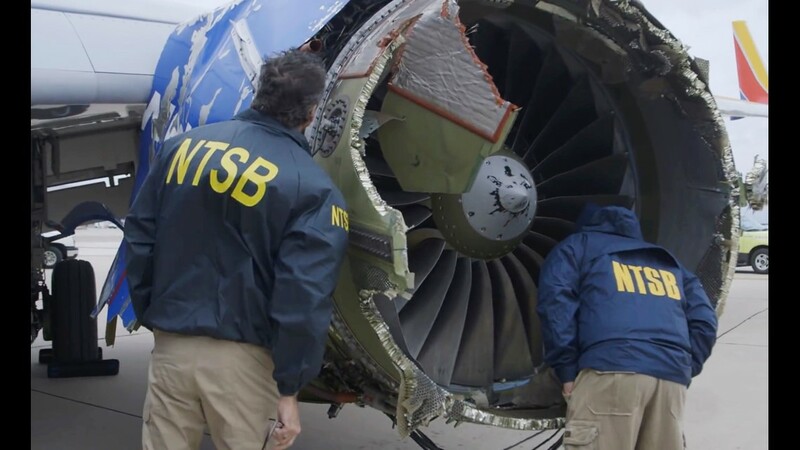 A preliminary examination of the blown jet engine of the Southwest Airlines plane that set off a terrifying chain of events and left a businesswoman hanging half outside a shattered window showed evidence of "metal fatigue," according to the National Transportation Safety Board. 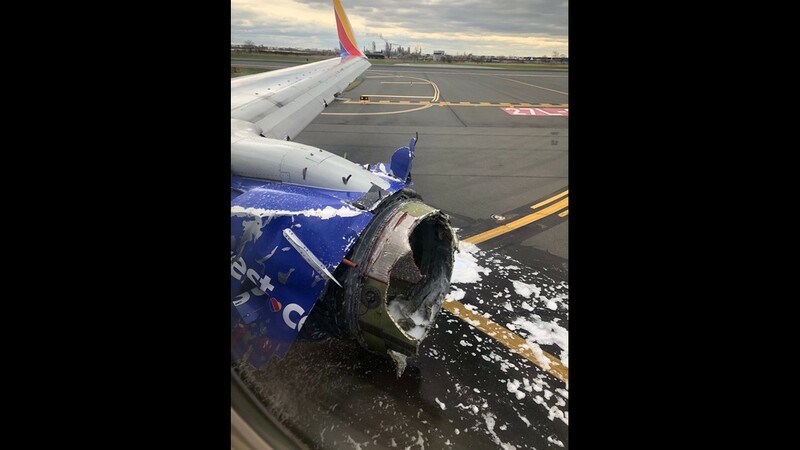 Southwest Airlines Flight 1380 sits on the runway at Philadelphia International Airport after it was forced to land with an engine failure, April 17, 2018. 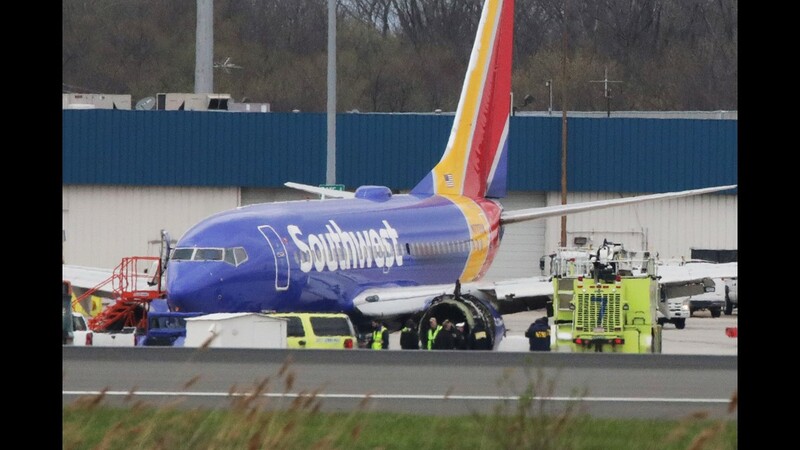 Southwest Airlines plane sits on the runway at the Philadelphia International Airport after it made an emergency landing in Philadelphia, Tuesday, April 17, 2018. This photo from a Twitter post by Joe Marcus (@joeasaprap) on April 17, 2018 shows the damaged engine on the Southwest Airlines flight 1380 airplane with a caption reading: "What a flight! Made it!! Still here!! #southwest #flight1380"